The cold wind is whistling down the chimney, and through the window I can see snow driving sideways across Canboro Road. Here inside, beside a roaring fire, we are surrounded by seed catalogues from a few trusted suppliers. It may be mid winter out there, but in here, our thoughts are firmly fixed on the coming spring. We've inventoried and catalogued our seed stock, and sketched out a rough plan for the coming year. Ordering strictly certified organic seed and especially the right quantity of seed is always a challenge. Order too much, and the seed may not be reliable the following year. 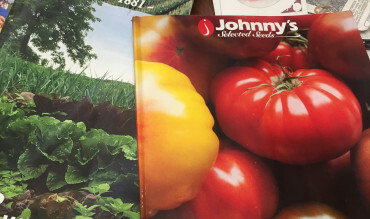 Order too little, and with the vagaries of Mother Nature, weather, pests and myriad other challenges, we may find ourselves short during the critical planting season. This year CSA Members, 2 weekly Farmers Markets and several excellent local restaurants will be relying on us to provide a continuous supply of fresh, organic fruits and vegetables. No pressure, eh?! Truly though, this seed order business is educated guesswork at best. The pictures in the seed catalogues beckon to us, the newest, the hardiest, the most colourful, the trendiest. It makes us want to try more and more and more. But therein lies the the nub of the issue. How much can we do, given the limitations of land availability, and most crucially labour? This is where wishful thinking smacks hard up against reality. As always, by analyzing our journals from past seasons, we can review our successes and failures and continue to hone our methods. That makes each year just a little more refined and predictable, which is great. But not too predictable, because that wouldn't be any fun! 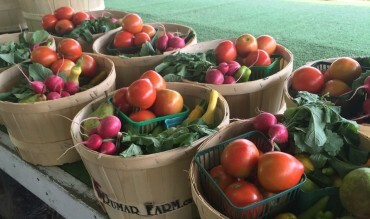 Is a CSA farm share right for your family? Join our newsletter list for updates on our CSA Farm! © Rumar Farm. All Rights Reserved.